Sydney (AFP) – Rugby Australia Thursday lodged an appeal against a one-match ban handed to Wallabies fullback Israel Folau arising from a contentious final Test with Ireland last weekend. Folau faced a World Rugby judiciary hearing Wednesday after being yellow carded and then cited for a second incident under the high ball in Australia’s 20-16 loss to the Irish in Sydney on Saturday. He will miss the NSW Waratahs’ Super Rugby clash with the Rebels in Melbourne on Friday if it is upheld at an appeal hearing on Thursday evening. Before the verdict was handed down, Waratahs coach Daryl Gibson said he feared rugby was in danger of legislating the aerial contest into oblivion if the suspension was allowed to stand. The ban came as a result of Folau’s involvement in an aerial contest for possession with Peter O’Mahony from a restart in the ninth minute of the final Irish Test. 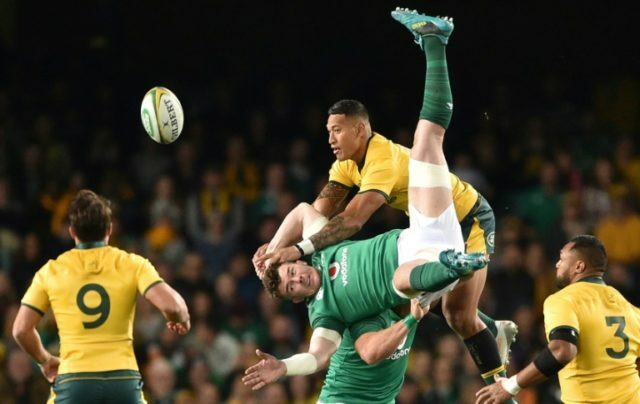 Folau won the ball, but it was ruled at the judicial hearing that he made dangerous contact with the Irish skipper, who was forced from the field after crashing heavily to the ground. Folau is an attacking threat from kick-offs given his athletic leaping ability. The Wallabies and Waratahs often kick short and high to give him a strong chance of catching or tapping back the ball from restarts, regaining valuable possession.